As we reflect on the year, we thought it would be lovely to share a video of some of our long term students talking about the progress they have made over the years. 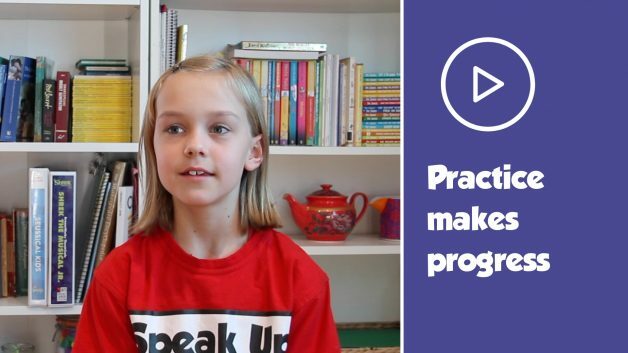 There is enormous value in sticking with an activity for a while, and the brilliance of the Speak Up program, is that students can start with us when they are three years old, and progress into program after program until they finish school! We don’t focus on perfection in class, instead we focus on letting kids be kids and make progress in their own time. Practice does not make perfect, it does however make progress. Unlike most classes you get to pick what you want to learn. You get to specialise in what you want to. Practising is a good way to spend my time. James performed to myself and my husband at parent watching week this morning and he loved it! Pass on our thanks to Miss Maddie who takes the class. It is a delight to find something that he is keen on.